ORIGINSThe Reed-pipe is a very ancient instrument, perhaps already known by Samnites and Romans. Yet, one of the most discussed issues is the sack aerophones origin, as historians have fragmentary and unsatisfactory documents at their disposal. This makes impossible the reconstruction of birth, development and preservation of this musical instrument. The first news about the utilization of a sack instrument date back to the Imperial Rome age. The Latin biographer Suetonius writes that Nero could play three instruments, among which the reed-pipe. At the present time, apart from these quotations about Nero, we don’t have indisputable information about previous statements, even though, according to a legend, in 55 B.C. Julius Caesar, during the British region conquest, succeeded in defeating his enemies thanks to the reed-pipe sound. In fact, the Samnite Turno together with one hundred Roman soldiers gave the enemy horses a fright with the shrill sound of the reed-pipe, put the British people to flight and won the battle. Yet, this is a legendary story, unfortunately without any concrete and historical reliability. People have often considered the reed-pipe handicraft like a poor, minor one, because of a prejudice: the reed-pipe was seen as a musical instrument linked to poor trades and lifestyles; actually, the instrument and its handicraft are linked to rural and pastoral life, but are also integral part of a millenary culture and tradition full of history. Fortunately, nowadays, the reed-pipe recovered its dignity so you can listen to it also in the most prestigious concerts not only in the ethnic music ones. Spread all over the territory in the past and almost disappeared today, in Scapoli, the artisan production of reed-pipes sees a good reproduction and cultural revitalization. The craftsmen of Scapoli keep jealously in their workshops the secrets of the reed-pipe construction as an ancient technique. As in the past, the instrument is formed by three wooden sound-pipes and a sheep-hide sack. The wooden parts are constituted of olive, maple, sorb or plum, cherry and apricot tree essence, even though the best wood is the ebony, but difficult to find and more expansive. The central pipe that utters the fixed note is called “burden”, the other ones that execute the musical chords are called “left” and “right”. The sheep-hide sack accumulates air, which is driven to the central pipe uttering the background shrill sound of the reed-pipe. In the current musical tradition of the Molise, the reed-pipe is the instrument linked to the culture of three towns: Scapoli, Castelnuovo a Volturno and San Polo Matese, but the sack aerophones are still used in other resorts as well. In Castelnuovo and San Polo there is still a remarkable number of pipers; while Scapoli, besides of being a place with a conspicuous presence of players, is the centre where the instruments are produced. In Scapoli, people construct two kind of reed-pipes: the peg and the lame one. • Two kinds of bells spinning at the end of the chanters spindle: the rural one (with a widely flaring bell) and the “vezzanese” (with a smallest bell). 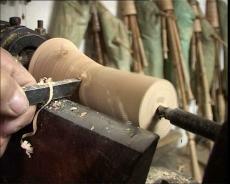 The commonest woods for the construction of the reed-pipes of the Molise are the olive and cherry trees. But also other plants are used for it. Many instruments are produced through a mix of woods: (cherry tree for the bells, olive tree for the chanters spindles and the burdens). For the leather bags, they commonly use the cars inner tubes covered by false fleece. Occasionally and if requested, they use animals hides (goat or sheep). There are different models of the peg reed-pipes of the Molise, distinguishable by prefixed numbers. Today, the players prefer the model 25, but also the 28 is quite diffused. Their sizes and numbers correspond to the instruments intonations. In Molise, the peg one is for accompaniment, played together with the reed flute, which executes the solo parts of the musical pieces. The reed flute of the Molise (biffera) has 9 digital holes (8 front, 1 rear) and as well as the reed-pipe, it is constructed in different models – for sizes and intonations – suitable to play with the correspondent reed-pipe model. The reed-pipe with no peg, constructed in Lazio and Molise is called lame (cioppa in dialect). Its major chanter – because of the peg absence – is shorter than the one provided of this metal device. In Molise, its utilization is almost disappeared. The scupina of the Molise – now extinguished – aimed to “support” the voice in songs executed during the important festivities of the year (New Year’s Day, spring rites) and the serenades. Therefore, the Reed-pipe is the expression and testimony of a millenary, rural and pastoral community, but since 1975 it has been a moment of fun, union, comparison and cultural exchange during the International Festival of the Reed-pipe of Scapoli in the summertime. The Festival – year by year – is more and more successful, attracting musicians, lovers of the reed-pipe from all Europe and simple tourists interested in the cultural, local reality where you can enjoy music tasting typical foods. Thanks also to this event, the reed-pipe is not considered a poor and Christmas musical instrument anymore. Other initiatives aimed to protect and promote the artisan and musical tradition of the reed-pipe are the National Museum of the Reed-pipe, opened by the Commune of Scapoli in 2002 and the Reed-pipe Club instituted at the end of 1991. Besides of exhibiting Italian and strangers instruments, the Museum is provided with a soundproof room for the reed-pipes tuning, which is possible with no echo. Inside the Museum you can also see the reproduction of an artisan workshop. The main aim of the Club is to create a point of documentation, protection and increase of value of the ancient sack instrument, in the small village of the Molise. The Club succeeded in awaking local and national interest towards this instrument and making Scapoli a major point of tourist attraction, together with the new reality created with the introduction of the area of the Mainarde in the National Park of Abruzzo, Lazio and Molise.